James Wellbeloved Lamb is a wholesome, natural and tasty cat food providing all the nutrients needed by a healthy cat. The recipe helps to maintain optimum health in your cat, with lamb providing a brilliant protein source that is both palatable and very easily digested. Omega oils help keep coats in perfect condition and cranberry aids prevention of urinary dysfunctions. Naturally healthy for kittens and nursing mothers. Ingredients: White rice (min 26%), Lamb meat meal (min 26%), lamb fat, maize gluten, potato protein (min 7%), lamb gravy, tomato pomace, omega-3 oil supplement, chicory extract, carrot, cranberry extract (min 0.05%), DL methionine, lysine hydrochloride, taurine, threonine, zinc methionate, yucca extract, rosemary oil. Typical analysis: Protein 32%, oil 20%, ash 8%, fibre 1.8%. 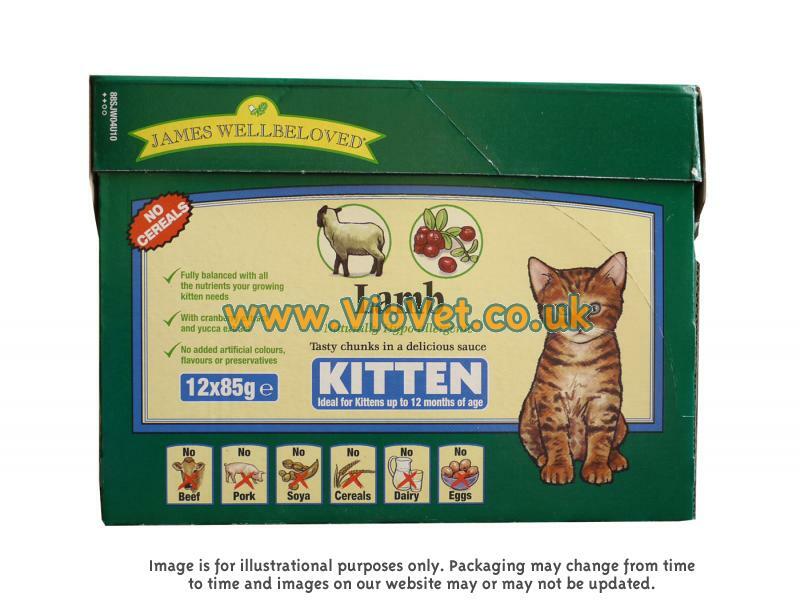 There are currently no questions for James Wellbeloved Lamb Kitten Food - be the first to ask one!